Nineteenth-century Britain was then the world's most prosperous nation, yet Victorians would bury meat in earth and wring sheets out in boiling water with their bare hands. Such drudgery was routine for the parents of people still living, but the knowledge of it has passed as if it had never been. Following the daily life of a middle-class Victorian house from room to room; from childbirth in the master bedroom through the kitchen, scullery, dining room, and parlor, all the way to the sickroom; Judith Flanders draws on diaries, advice books, and other sources to resurrect an age so close in time yet so alien to our own. Judith Flanders is a historian and journalist who focuses her efforts on the Victorian era. This is a fascinating social history on what daily life was like in the Victorian era for people of all social classes. Domestic histories of various eras are something of a favorite of mine, and so little of the daily lives of women and servants enter into the historical record without someone like Flanders illuminating them. 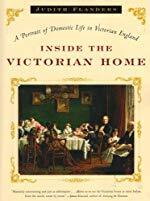 This book is also a window into why our homes today are laid out the way they are, as it was in the Victorian era of both England and America that what we would consider the modern western home was entering into canon as it were. This is a fairly lengthy tome that is very well researched and some of what was normal inside the house for this time period will shock you. Ok, I don't know if this comment is appropriate, but I don't have the time or ability to read the book yet am dying to know about burying meat. Google only talks about cooking in buried coals and it seems like the book is referring to something else. Can you give a short breakdown of what it actually is? I don't know specifically about Victorians, but preservation through burying under certain conditions is a pretty widespread preservation technique of Olden Tymes. Off to the library to get this -- definitely sounds like my kind of book. I believe Bill Bryson quotes Flanders in his book Home: A Short History of Private Life, although I can't remember if it's this work or another one.